Member of Heartlands Hayride Show – broadcast live the 2nd and 4th Saturday of the month, 6 PM to 8 Pm on wdvrfm.org – Sergeantsville, N.J. Renowned for her crystal clear vocal quality and her clean, crisp delivery, Ann Brown is a true country music performer in every sense of the word…….one who puts her heart and soul into every song and performance, and is an absolute pleasure to watch and hear. Ann began her career at the age of seven, singing and learning to play the guitar…..her early performances were at school and church events. She formed her first band at age 13, and entertained at local fairs, carnivals, banquets and fund-raisers, and has appeared on various television shows on WCAU and WPVI in Philadelphia, and on Easton, PA public TV. She and her band performed at the Republican National Convention in Philadelphia in 2000. 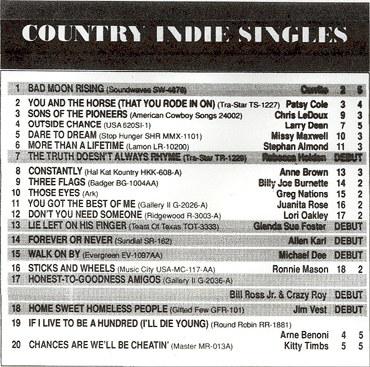 Ann Brown was a regular performer on WNAR’s Sunday morning Country Music Showdown in Norristown, PA. As if her distinctive voice weren’t enough, Ann is an accomplished musician, who plays guitar, bass, accordion, steel guitar and keyboard. Always willing to lend her talents to a worthy cause, Ann has been a part of many telethons for Multiple Sclerosis, March of Dimes and flood victims. Unpretentious and fun-loving, Ann Brown is a consistent top-notch performer, a true delight to her audience, and is indeed “Constantly Country”. 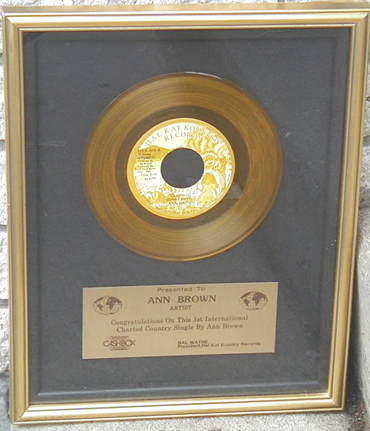 Ann's Cashbox Award for her #8 Chart Hit single "Constantly"